Unfortunately car components wear out over time and the hazards you encounter on the road cause parts to become damaged or broken. At Orr Automotive we focus on helping you keep up with preventative maintenance so that you don't have big surprises that leave you stranded on the side of the freeway. We service all of the Inland Empire. 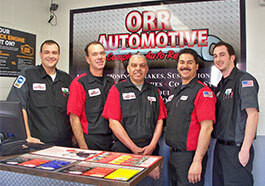 At Orr Automotive we take preventative maintenance very seriously. Our techs check all of the following and preform all needed services with your permission.